BIRD HELPS CHILDREN'S SPIRITS SOAR! Thank you Impact NW and The Gateway Center for Domestic Violence Services for bringing Bird That Wants to Fly into the lives of children and families you serve! Here we are on November 12, 2015 from left to right: Erin and Kate who are parent child specialists of Impact NW, Bird, myself, and Martha Strawn Morris, the Director of The Gateway Center. For more information on these valuable services please see http://www.impactnw.org and http://www.gatewaycenterdv.org. Thank you SMART! The award winning literacy organization, Start Making a Reader Today, http://www.getsmartoregon.org, is now sharing Bird That Wants to Fly with children and reading mentors! Here's Nathan Buck (SMART, Central Metro Senior Program Manager), Bird, and myself on November 19, 2015. Two hundred books have been donated to SMART! 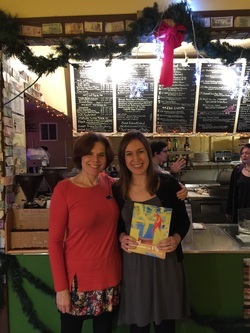 Here's what Nathan wrote about the donation, "We feel grateful to include this book in out collection, because of its powerful storytelling and themes of healing, art, community connection, and self confidence." He ended the letter with, "I wholeheartedly recommend Diane Kaufman's Bird That Wants to Fly for any and all children's books collections." Thank you, SMART, for your belief in Bird That Wants to Fly! 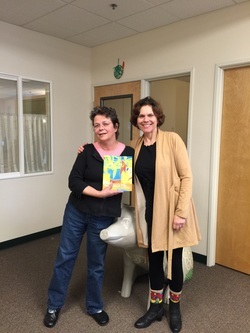 ​Today, despite darkened sky and at times down pouring rain, I drove to Corvallis, Oregon to meet with Jill Irwin, MS, Education Manager of the Old Mill Center for Children and Families, http://www.oldmillcenter.org. Jill gave me a tour of their program with its many services for young children, parents, and families. I was very impressed! Jill is going to brainstorm with their care providers on how to bring Bird That Wants to Fly with its story, music, and theme of resilience into their services. When I drove back to Portland (90 minutes away), there was a rainbow in the sky! Many thanks to Old Mill Center for Children and Families! Here I am after a fantastic meeting with Devon Burris of Family Stability and Employment Unit (FSET) for Self Sufficiency in District 2 (Multnomah County). Ms. Burris is actively involved as organizer and facilitator with their Trauma Recovery and Empowerment Groups which is a 26 week program for women which models and teaches "self-care, self-respect and compassion for self and others." Ms. Burris wants to bring Bird That Wants to Fly to these women and their children! She will be introducing me to others within her agency and also in the community who might want to incorporate Bird into their healing activities. When I think about the possibilities for good that will emerge from our creative collaboration, I am so inspired and thankful!